Genesis Normy's Beach Babe-o-Rama (USA/Europe) in 12:04.42 by nitrogenesis. 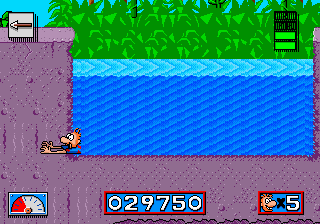 Based on the comic strip Making It, Normy's Beach Babe-o-Rama was released in 1994 by Electronic Arts. The plot is that Normy's hanging out with some beach babes when suddenly an evil alien ship beams them aboard! Normy recieves a note that he's the only one that can save them and so he uses some magic suntan lotion to travel through time to rescue them. NitroGenesis abuses Normy's dash to make quick work of the game's six levels, with the occasional glitch thrown in for good measure.